I don’t Care if you Lick Windows, Take the Special bus or Occasionally pee on yourself. Bless you hang in there, Sunshine, you’re special and I love ya! The sky is glowing, the chickens are singing!!! Gonna be a bright bright bright sun shiney day!!! Bonsai, a naughty Siamese boy, and Grasshopper, a big tabby and white former tom, were having some kind of awful argument all night. It was still hard to sleep in the 9th Life Center for all the screaming and name calling, even though they were polite enough to take it outside to their Day Room. My gosh I’ve never heard such insults. This is about what they sounded like!! WARNING, do not play around your cats. If they’re in the room turn the volume off. They very likely will attack your computer. Mom and me kept having to get up and go out in the cold and tell them to cut it out and to each go to different parts of the 9th Life Center and behave. They both looked at us and said, “Oh YEAH? You gonna MAKE us? Hey human, think about how thin YOUR skin is!” And mom sure knew better than to touch them cuz she didn’t want to be cleaning up blood. A mad cat will attack anybody who get in their way. Usually if somebody gets mad in the 9th Life Center we all run to take sides and get involved. But we knew better with those two and just covered our ears and tried to sleep. Them big bad boys! And LOOK !!!! You all are my HEROES !!! You’ve got us all the way up to 64% of our goal. We just might make it!! What do you think. We just might make our Double Your Donations fundraising challenge!!!! Only three more days to go - COUNT DOWN - will we make it??? YOU can help make it happen!!! Oh gosh I hate to keep nagging but you DO need a tax write off don’t you? Count down for TAX DEDUCTIBLE DONATIONS for 2010 only THREE more days to feed us instead of Uncle Sam !!!!! If you’re sending a check make sure you date it the day you write it and post it pretty quick and then it counts!!! If every one of you could just spare 50 cents we could do it and we’d all be WINNERS!!!! Mike is headed over the river and thru the woods !!!! To Purina’s Food Packaging Plant in Pennsylvania!!!! Yum yum yum yum . He’s coming back with 2,000 pounds of dog food!!! Yippee Yippee the dogs will be very happy !!!!! With this cold weather we’re using about 50 pounds of dry dog food a day for the dogs. And another 100 pounds for the wildlife. We discovered long ago that if we wet out wildlife stations the foxes and their friends would eat dog food instead of try to catch our chickens and ducks and geese!! We figure that’s a fair trade off. I’ll feed you if you promise not to eat my animals!!! Feluk kids Lilly a lovely silver tabby and Russell a delightful little tiger tabby joined us over the holidays. Lilly came from Indiana and Russell came from South Carolina but they speak the same language and are becoming fast friends. They’re doing their quarentine in side by side cages and having lots of fun playing with each other. Mom says with this cold weather there’s wall to wall animals with all the free rangers coming inside!! She says she can’t get any work done in here !!! and a chukar in a cherry tree. That’s it folks!!! 28 Days !! The animal with the largest brain in proportion to its size is the ant. They are the smartest species of insects with about 250,000 brain cells. River Rat is one of those I didn’t take "before" pictures of. I didn’t think she stood a chance of recovery. I can never bring myself to take pictures of the ones that I don’t think will make it. It just feels wrong. River Rat came to us almost three years ago. She was one of the most pathetic things I’ve ever seen. Her legs were rotting off from the elbows and knees down. She was skin and bones. She’d been found floating on a log with all four legs dangling down in the water in Georgia. 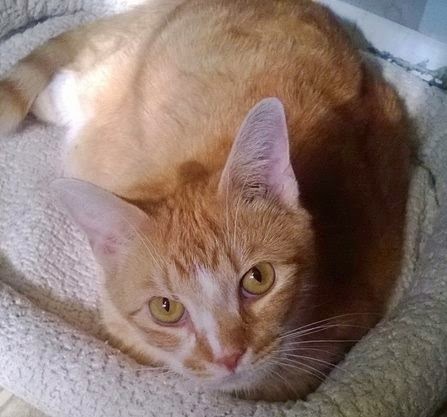 Someone rescued her and she found her way to Winging Cat Rescue where a foster mom started to care for her. The doctors there and her foster mom worked really hard trying to save her legs. Every toe was badly infected, the pads almost shredded, infection in the bone had deformed the legs. Poor little River Rat couldn’t even sit up, let alone take a walk. She couldn’t even get to a litterbox. The wounds had gotten better, but were not totally healing. It seemed no matter what medications were used, the infection would just come back. She sure seemed like a hopeless case. We’d just healed Merlin from a horrible mauling where he’d lost the skin on almost half of one side of his body. And so Barbara at Winging Cat Rescue asked me to please try and see what we could do for River Rat. She described it all to me, yet I was still shocked to see this poor little thing. Did we stand a chance of saving her? I’ll do anything in the world to save somebody as long as I can believe there is hope. When I know there isn’t, then I have to let go and let them go to Rainbow Bridge. What should I do? River Rat had the brightest eyes and though she was timid and fearful, something about her begged to be given a chance. And so we went to work. Management, care and cleaning of the wounds and helping them to get about without causing any more injury is what it’s all about. Soaking foot and leg wounds on dogs or horses is one thing. Cats, who hate water, quite another. And poor River Rat had to endure long soaks four times a day. 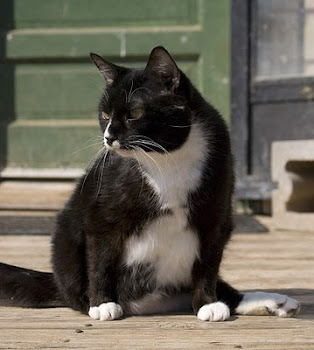 Those of you who’ve dealt with an injury on a cat that required soaking are, no doubt, thinking, but didn’t you get bite and clawed. Not clawed as her toes were so damaged and swollen she could barely moor her hands or feet. Bit - you bet ‘ch! It’s all part of the job. Fortunately we all understand that it’s just a response out of fear an no evil is meant, and so we soak ourselves, bandage up, and go on. Eventually River Rats knees and elbows began to heal. Gradually the infection receded down the legs. Finally the swelling in the paws went down. We wondered if the toes would ever heal. Would some or all end up having to be amputated? She had begun to walk on the pads without putting the toes down. Her legs were quite twisted and badly damaged. But she was virtually pain free and starting to act like a cat. And one by one the toes healed. One stayed limp and swollen a few weeks longer. And then finally healed. Over the next year the fur grew back to cover the scars and she continued with physical therapy on her toes and fingers and wrists and ankles and elbows and knees twice a day. She thought of her therapy times as play times. She began to run and play. That last toe healed! We all sobbed tears of joy! Her right arm twists slightly out but you don’t even notice it when you watch her play and run. She’s now a mascot kitty and has free range of the farm. She prefers to be out most of the time. We’re making her come in at night now cuz she just doesn’t see to go somewhere warm and we don’t like her just sitting around sleeping on the ground in this snow. She’s not really caged in the picture above. She comes into the 9th Life Center and enjoys finding a bed in an empty cage to use for the night. She’s just snuggling down for the night. First crack of dawn, and she’ll be back out playing. It looks as though a bunch of students keeping their nose to the grindstone were given a pick-me-up by some adorable, furry creatures. PeoplePets.com reports that co-eds at Tufts University were offered the chance to take a break from the stress of finals week after being visited by a bunch of therapy puppies. The program was the brainchild of resident director Michael Bliss, who turned to the organization Dog B.O.N.E.S to find the handful of loveable pups. "Students really love the chance to get away from their books and get rid of some stress for an hour," Bliss told the news outlet. "Many of them are freshman who haven't seen their homes or dogs for a few months. It brings them back to the feeling of home and comfort." Since the event, other dormitories on the campus have also taken advantage of calming the students with visits from the four-legged creatures as well. It's easy to see why - therapy dogs have shown to help those suffering from anxiety, post-traumatic stress disorder, and other mental issues. 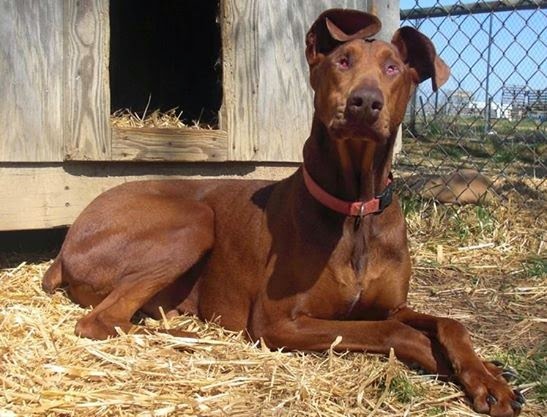 According to its website, Dog B.O.N.E.S, which stands for Dogs Building Opportunities for Nurturing and Emotional Support, was established by Jeanne Brouillette in 2002. QUESTION: Many of the chickens are in the fenced area and have Chicken City to sleep in. Others are roaming outside the fenced area. It seems like there are chickens everywhere. Why aren’t they allowed to be in the fenced area and where do they go to sleep? Were they banned from Chicken City? ANSWER: I never thought of the “in the fence” and the “out the fence” population of chickens as different! They actually can fly over the fence so it’s their choice which side they want to be on. The fence is there to keep other animals away from them, not to keep them in. Their food is in there and the goats and all would steal it. Also some chickens are bothered by dogs and so forth and they prefer to stay in the fenced area. Others like to wonder about all day, catching bugs in the summer months and hoping for a hand out or to steal something from the doggie’s bowls! Chicken City is the big yellow building inside the fenced area. Most of the chickens go in there at night. They just go home at dusk - that’s what chickens do. Once they know where home is - every night for three - four weeks you put a new one in the house then they remember - and go in as it’s getting dark. Someone then closes up the house after dark and opens it up again in the morning. That’s for their protection too in case there’s any wildlife about that our dogs don’t chase off at night. Some of the roosters insist on sleeping in trees year round. Though virtually all the hens go in the house in the winter. The ones that stay out move from deciduous trees to ever greens in the winter. Did you notice the huge cedar next to Chicken City? That’s called the Chicken Tree and is quite full in the summer time. Only about five tough roosters are staying up there now. PS You tell me what you want! Email me at Vincent@RikkisRefuge.org with instructions to change your subscription: additions, deletions or modifications! Subscriptions: Vincent’s VIPs - up to the second alerts about issues at Rikki’s Refuge for those who care and want to be intimately involved. Scheduled as needed. Good Morning Good News - a little something to get you going in the mornings, for those of you who want to keep smiling with us! Scheduled daily. Hairballs - so you know what’s coming up at Rikki’s! Scheduled weekly. 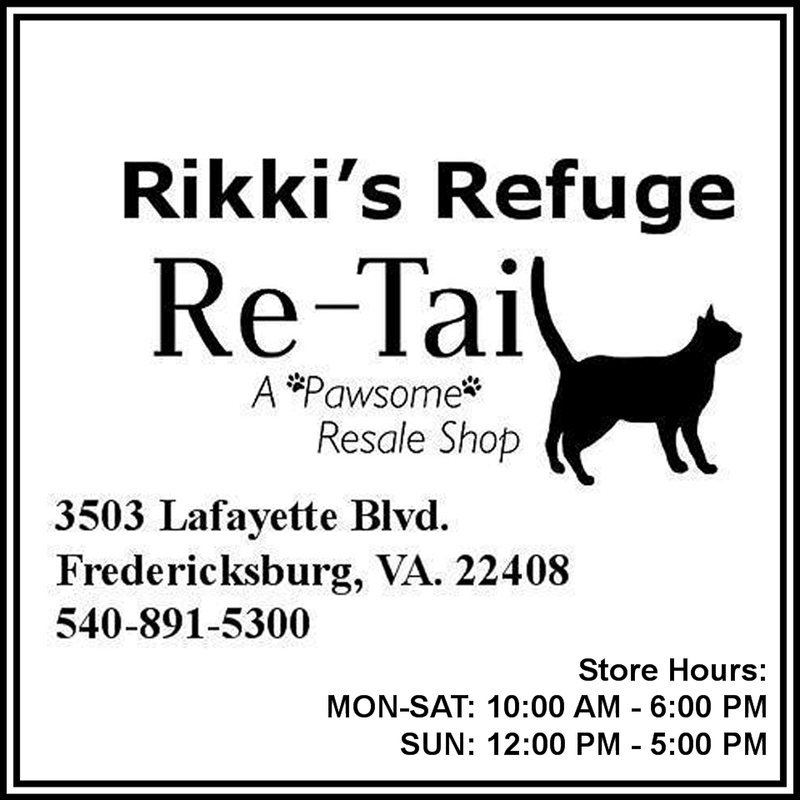 Rikki's Refuge is owned and operated by Life Unlimited of Virginia, Inc., an IRS 501(c)(3) not-for-profit Virginia Corporation, tax-id 54-1911042. Combined Federal Campaigns #77674, Commonwealth of Virginia Campaign #3163, PetsMart Charities #1377. A financial statement is available upon written request from the State Office of Consumer Affairs. 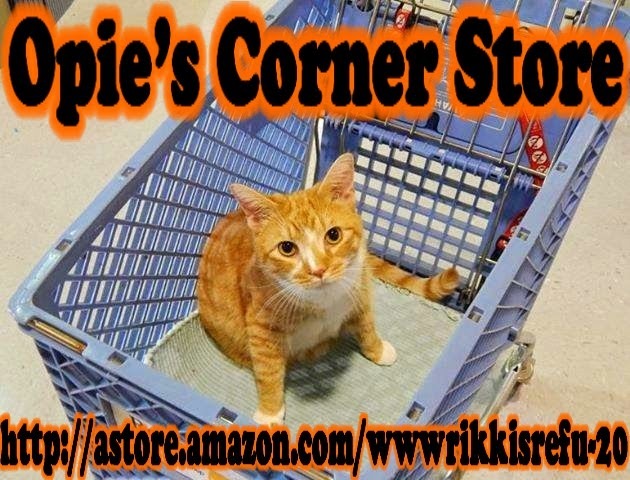 Learn more www.RikkisRefuge.org and help spread the good word, tell everyone you know about Rikki’s Refuge. Great Post today Vincent! I loved meeting River Rat this weekend and am so glad you told his story to everyone today. He is such a sweet kitty. You all have worked another miracle. Thank you to all the staff who got bitten and still saved this little guy!